Amy Beth Dambeck and Jenna Hedden started For Shore Baby to help make other families’ vacations as fun and stress-free as possible. Raised at the Jersey Shore, we provide unsurpassed products and services to make your family’s stay relaxing and enjoyable - what any visit to the Shore should be! Traveling with your baby has never been easier – we deliver and set up everything you’ll need on your stay. Daily, weekly and monthly rates, special discounts and packages are available. We welcome custom orders and will do everything we can to ensure that your trip to the Shore is as hassle-free as possible. We deliver to Monmouth and Ocean Counties, Ocean City, Cape May and Surrounding Areas. Call us today to start planning your getaway! We are your local baby equipment rental company at the Jersey Shore. 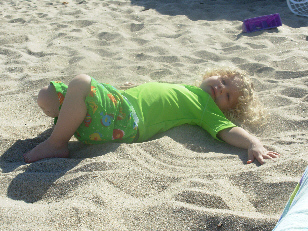 We have everything to make your vacationing baby or guests feel completely relaxed! All of our products are brands that we moms trust. All of our cribs are new, JPMA certified and meet ASTM standards. Our linens and equipment are selected for exceptional quality and comfort and are cleaned exclusively with baby friendly, eco-friendly products. Delivery areas include: Avon. Bay Head, Belmar, Bradley Beach, Brielle, Brick,Brigantine, Cape May, Deal, Long Branch, Mantaloking, Manasquan, Margate, Ocean Grove, Ocean City, Point Pleasant Beach, Sea Girt, Seaside, Spring Lake, Wall, Wildwood, Wildwood Crest, and all Jersey Shore towns. Copyright 2008-2009. For Shore Baby Equipment Rental, LLC. All rights reserved.